« Samsung N140 Notebook: Super Portable! This is an ad for Nestea Red Tea that was found in a men’s magazine. 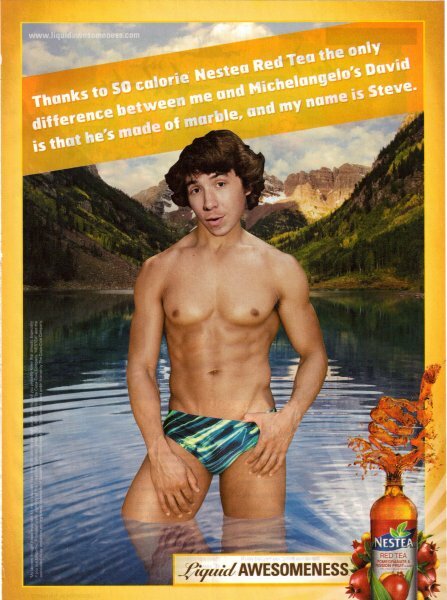 Thanks to 50 calorie Nestea Red Tea the only difference between me and Michelangelo’s David is that he’s made of marble and my name is Steve. Is anybody else a little creeped out by the photoshopping in this ad? It’s bad enough that I have to assume they intended it to be really, really obvious, but still… This doesn’t make me think their product will help people achieve such bodies. It makes me think their product will help people believe their own weird delusions. This entry was posted on January 16, 2010 at 12:00 pm	and is filed under Food. Tagged: nestea, print-ad, red tea, weight. You can follow any responses to this entry through the RSS 2.0 feed. You can leave a response, or trackback from your own site. Gah. That is definitely worthy of Photoshop Disasters. The image put up against his claim is just… wow, someone was so not thinking.